"As a Haitian citizen, it frustrates me when I see someone fetching water on a police vehicle (neg k ap bwote dlo ak machin lapolis) to bring to his home," Haitian journalist Guerrier Henry said on his radio show Boukante Lapawol. Claudy Gassant, a former commissaire du gouvernement in Haiti, who was a guest on the radio program said: "In Haiti, we have all the rules in place but those rules are not followed. We see how citizens of other countries behave by we refuse to do what they do." "The police commissioner is responsible for all the police vehicles and the police officers driving them in his jurisdiction. So how does a police car end up being used for personal reasons," he asked. Claudy Gassant compares the 'desordre' in Haiti to police cruisers in the United States where the police officer, before taking a police car out to patrol the streets, has to sign it out of the precinct and log the mileage do a full body inspection of the vehicle, and login how much gas is in that vehicle. "En Haiti pa gen pagan konsa. Yon machin police nenpot ki moun ka pran l" (In Haiti there is no such thing. a police car, anybody can drive it), Claudy Gassant said. "Even family members of a police officer can drive a police car in Haiti. Si dlo tap koule nan tout kay, èske tap gen nesesite pou yon polisye ap bwote dlo? Enben sa a pi mal si policier ki gen machinn nan poul pa ka pran ti dlo pou fanmi l enben sal ye la? Ah m pa wè pwoblem lan neg la ap travay nan yon institisyon ki pa menm peye pou l pa ka jwen sevis pran yon ti dlo pou fanmi l? Bann méchant sa pou nou pale a nou pa janm pale l.
policier peye tax chak mwa e se kob sa yo ki bay machin yo. Anything is ok and possible in Haiti. Becauae the man that represents and to protect his citizens is also guilty of many crimes. Bon se komisè police yo k'ap bwote dlo yo. Le problème est beaucoup plus profond. Si l'état te bay moun dlo lakay yo eske brote dlo tap fè pati kourikouloum policiers yo? Ann serye pou yon fwa. 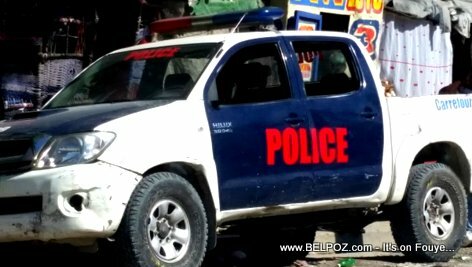 Anpil policiers en Haiti ap itilize machine la police à des fins personnels. Machine la police tonbe nan bwote dlo, se sa yon jounalis fè konnen.